Our travelling band of intrepid funny-makers is taking over Australia, one town at a time, with the Melbourne International Comedy Festival Roadshow! 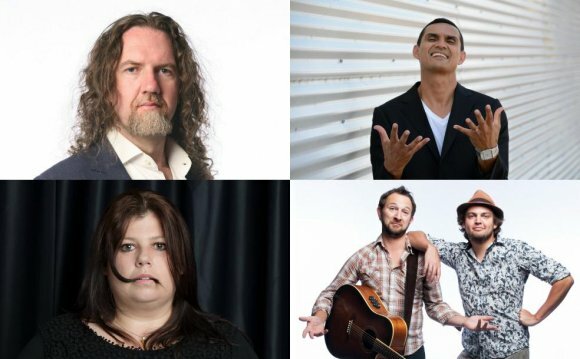 Join a rotating cast of the finest local and international comedy talents for an evening of comedy like no other, hand-picked to bring the biggest and best belly laughs to audiences from Mildura to Mackay, Devonport to Dubbo. We are excited to announce the full line up! This years Roadshow will star Bob Franklin (MC), Xavier Michelides, Pajama Men (USA), Rachel Berger, Sean Choolburra and more! Rachel is one of Australia’s favourite stand-up comedians, working as a comedian, broadcaster, novelist, columnist, agitator and television entertainer. Rachel’s high public profile has done much to establish the position of women in comedy, providing a distinctive voice for women’s opinions and viewpoints. Since emigrating from Perth to Melbourne, Xavier has been an active stand-up comedian, writer and performer. He has performed in ten Melbourne International Comedy Festivals, three Melbourne Fringes, two Adelaide Fringes, three Perth Fringe Worlds, two Perth International Comedy Festivals and one Sydney Comedy Festival. The world-renowned, Barry Award-winning sketch superstars return to Melbourne! Drawing on their huge catalogue of classic bits, some new material and endless improvised tangents, the Pajama Men create an anarchic night of jubilant and inventive comedy. Bob Franklin is an award-winning comedian, writer, director, author and actor. Some of his greatest comedy achievements include appearances in Please Like Me, Worst Year of My Life Again, Talking ’bout Your Generation and Thank God You’re Here. Sean has carved his niche as one of Australia’s top indigenous entertainers. Since winning the NSW Raw Comedy final in 2002, Sean has gone on to prove himself as a comedian, rapper, dancer, storyteller, actor & hip-hop didgeridoo player.